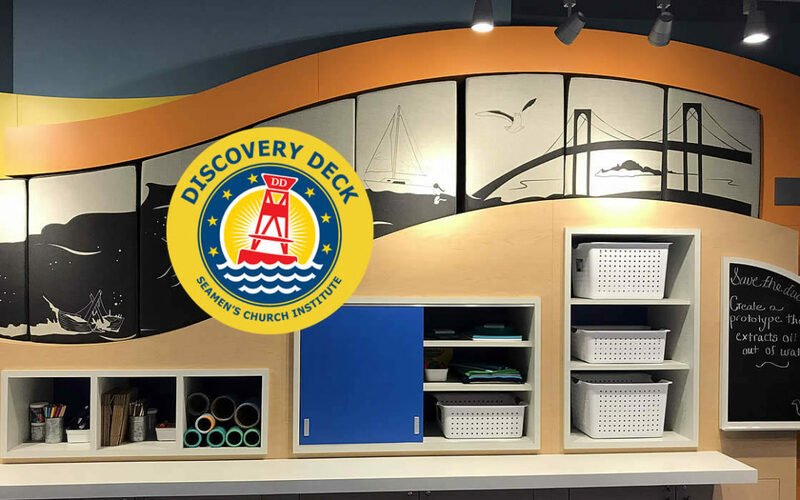 Seamen’s is pleased to announce the grand opening of The Discovery Deck on the 2nd floor of our building, open to the public Thursdays and Saturdays 9am-2pm. For Educators:While the exhibit is open to the public and appeals to all ages, its educational goals are focused on middleschoolers. Field trips and classes aim to increase students’ interest in STEAM subjects, expose them to marine industry careers, increase awareness of environmental concerns relevant to marine industry and increase engagement in the maritime community. For more information about field trips, homeschool sessions, weekend workshops and afterschool activities, contact Kaili Dunlap, Education Coordinator at kaili@seamensnewport.org or 401-847-4260.